The Federal Trade Commission and the Microsoft Windows security center have put out scam alerts and warnings to educate the public about a cyber scam that begins with an innocent little phone call. The caller pretends to be a concerned technician from Microsoft Windows alerting you to a problem with your computer, and things escalate from there. The victim ends up paying money for phony services and is left with a computer infected with harmful files. To protect yourself and keep your accounts safe, it’s not enough just to be aware that this type of scam exists. You have to be aware of how these scammers operate because they have stepped up their game. October is National Cyber Security Awareness month; please help spread the word by sharing this list with friends, family and anyone you know who works on a computer or laptop. Use the National Cyber Security Awareness Month 2015 hashtag #CyberAware in your social media messages throughout your different networks! This list was developed with the help of my client and friend we’ll call Emily, who was the recent victim of a cyber scam just last week. You will be warned about scammers: That’s right: the scammers will warn you about scammers as part of their excellent customer service. The current warnings issued from Microsoft alert consumers against giving out credit card information. The scammers will agree with you. To prove that they are in fact trustworthy, they will ask that you pay them with an E-check instead, which they claim can only be used once. They will even send you emails confirming receipt of payment. WHAT TO DO: Educate yourself. Stay updated about the newest trends and help spread the word. 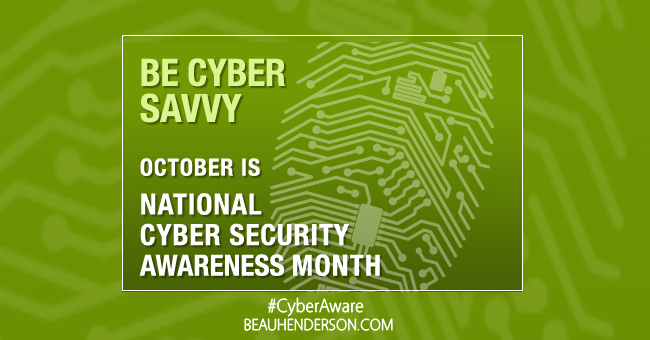 Be #CyberAware. If you receive an unsolicited phone call about any computer issues, even if the phone number appears to be from a legit company, hang up the phone. If you find that you do have a computer issue, contact the real Microsoft tech support yourself.